Chances are, at some point you’ve come home from a long day only to find your car just doesn’t want to fit into the garage. Perhaps it’s just a tight squeeze, or maybe the amount of clutter opposite the door has made it hazardous. For the longest time, the hanging tennis ball method used to be the best garage parking aid. But it dangling there all the time is annoying and it won’t work if you want to back into the garage. Other DIY methods may help with horizontal alignment, but still allow you to pull too far in, resulting in wasted space and a higher risk of damaging your car and anything in front of it. Technology and creativity have brought many different types of products to assist with garage parking. Some work great, others not so well. Getting a good parking aid can help you navigate those close quarters for a perfect parking job every time. The following products can ensure you’ve pulled in far enough to avoid damage from the garage door, but close enough to the door to maximize storage and walking space. Many will even work in multi-car garages, allowing the entire family to park safely. Garage navigation aids come in a wide variety of designs. Some use light, while others use shape or texture to help you navigate into a small space. Our recommendations span the full gamut of garage-based aids to help you choose the type that will best suit your personal needs. Parking in a two-car garage has its own series of dilemmas. Thankfully, the Maxsa Park Right’s dual Class IIIA lasers are perfect for the job. This ceiling-mounted device has two adjustable laser pointers which are motion activated to turn on when your vehicle approaches. By adjusting the laser heads to point at a specific spot on your vehicles, you can visually align either vehicle easily for the perfect parking job every time. The unit plugs directly into a standard household outlet, so if you have a garage door opener, you most likely have an available outlet in the perfect spot. You’ll never have to worry about regularly replacing batteries. Speaking of which, the Maxsa garage laser has a battery backup (3 AA batteries), allowing it to function even during a blackout. 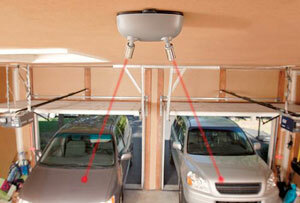 Consumers love how easy it is to install the this garage laser system. 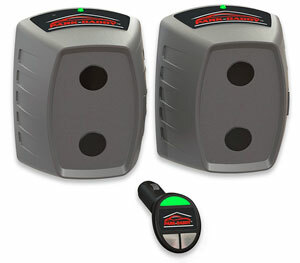 They report the motion sensor picks up movement very well and that the lasers are very clear. 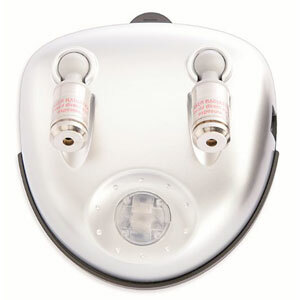 The biggest criticism of this laser device is the limited range. When placed in between two cars, the pointers can only be moved a short distance, making it necessary to aim it at mirrors or other close targets. Some users have instead used the device to point at two points of a single car, allowing for more precise navigation of that vehicle. Sometimes a simple solution can be the best, as evidenced by the 37358 Park Right mat (also by Maxsa). This small mat fits under one of your front tires to help you stop in the same spot every time. Anti-skid tape keeps the mat from moving, while a built-in drip tray catches snow, water, and dirt. Simply guide your car in using the reflective strip, and you will know you’re at the mat when you hit the first small bump. The tire then stops when it hits the second, larger bump. It’s similar to what a short wheel chock would do. Despite the simple design of this parking mat, users have found it a good fit for most garage scenarios. They note that the small bump is easily noticeable when you drive over it and the larger stop is almost impossible to overshoot unintentionally. The spacing between the two humps is big enough for any car tire, but small enough to prevent slipping out of the space. One downside is that the adhesive tape for this garage car stop doesn’t hold up as well as claimed, although many owners have remedied this problem by purchasing a heavier duty tape or even bolting the mat to their garage floor. Likewise, a common complaint is that the mat is made of plastic instead of rubber, resulting in the small bumper eventually getting crushed by extra heavy vehicles. One intrepid user solved this problem by pouring clear resin into the underside to make the mat a solid piece. Sometimes all you need for guidance is a simple garage parking stop. The “made in the USA” HD24 is a heavy-duty stopper designed for drive-through fire stations. When used in a home setting, the adhesion holds this strip in place, allowing you to feel when your car has reached the desired stopping point every time. As an added bonus, the stop includes decals to personalize parking spots in a two-car family garage. The majority of those who own this garage tire stop have noted the height to be perfect for when they pull or back into their garage. As a general rule, it will stay in place once properly installed and its height is high enough for the average person to feel upon contact. A parking aid such as this one also works well for those that have to use a large piece of cardboard to protect their garage floor from an oil or transmission leak. You’ll be able to easily position your vehicle so the cardboard is always under the area of the leak so you’re not having to spend time trying to clean oil off concrete if you’re not perfectly aligned. Not everybody is able to notice when they hit the Parking Target garage stop. This may be especially true of cars with excellent suspension or very large tires. A few have also had problems with the adhesive holding. Using infrared technology (similar to garage door opener sensors), the PDY-50-AA is a commercial-quality tool that helps maximize the storage capacity of your garage. Powered by four D-cell batteries, the advanced optics alert you when the car has cleared the garage door opening by as little as an inch, minimizing the amount of wasted space. 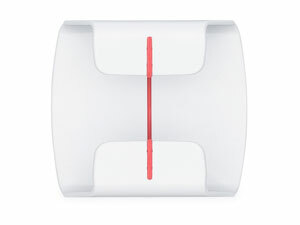 Simply mount the two sensors to your garage walls just inside the door using the peel-off mounting tape. An RF receiver that plugs into your car’s cigarette lighter then sounds and lights up when the infrared beams are broken. Many users who own this system have tried other alternatives and point to this as the most accurate garage parking guide. The RF unit’s LEDs are big enough that many owners mount it to their garage wall using an AC adapter so they can navigate multiple cars to the same spot. There is only one known flaw to this system, which is the need for line-of-sight. In a staggered garage setting, it can be difficult or even impossible to line up the sensors properly at the door, causing you to waste additional space. Creating an artificial mounting point may help with this issue, when possible. Using the philosophy of “simple is best”, the Park Ranger may be mounted with a nail, magnet, adhesive strip, or simply placed on a shelf. It requires two people to install (one sitting in the driver’s seat and one to actually position and mount the device), but needs no batteries or maintenance. Made of ABS resin for durability, the Park Ranger uses two lines to create a line-of-sight navigation tool. Simply drive the car in and line up the lines to park perfectly every time. What owners love the most about this parking assistant is its simplicity. Once installed, it will give the same results every time. It’s completely non-intrusive and requires no power or maintenance, making it a great choice for busy homes. The flaws with this product tend to be unavoidable. It cannot help you center your car, and the line-of-sight assumes you will always have the same height driver and the seat in the same position. These issues are less problematic for cars with only one driver. Many homeowners have trouble parking in their own garage, while others may need to fit into narrow public garage spaces. The following tips will help you master the fine art of squeezing your car into these small spots. 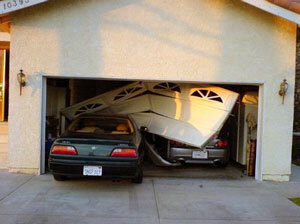 One of the best ways to fit into your home garage easier is to prepare the space. Make sure there are no cabinets or other large objects obstructing your path. Not only can poorly-placed objects block your car doors, but too much clutter at the back may not give your car enough length to fit in. Measure the car and check to make sure there is enough clearance to fit the car completely with the door closed. Obviously a good parking aid that will easily put you in the center of your garage (like our #1 choice above) will make parking super easy (even when you don’t have much room to the left or right of your vehicle). A good cheap common tactic is to attach a tennis ball or other small ball to a string or fishing line. When the ball touches your windshield, you have pulled in the correct distance. 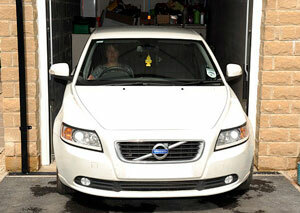 Other marks or guidelines can also help judge your position as you enter the garage by establishing line-of-sight. Those with a garage parking mat can use it to help align their vehicle left or right but since the outer lips on most mats aren’t very noticeable, you’ll still want something to let you know when you’ve pulled in far enough. One of the easiest mistakes to make when parking is to forget that your mirrors stick out. If you have a car where the mirrors fold, this might make life a bit easier by folding them before pulling into the garage. However, having stationary mirrors will require that you account for those extra inches of car width before pulling into a tight garage or a parking space next to a pillar. The saying “Practice makes perfect” is just as true here as anywhere else in life. Find an empty parking lot and practice parking from various approaches. Try backing in, pulling in, and getting back out again. Check after parking to see how well you centered yourself between the lines. You can also place soft, biodegradable foam or whip cream along the lines to monitor how straight you were while pulling in or out. Mastering in a safe environment will help with both public and private parking experiences where close quarters are unavoidable. When in doubt, having a passenger you trust can be the best solution. They can get out of the car and direct you using a better line-of-sight. Parking aids, such as those listed in this article, function similarly, giving you visible markers that show how well-centered your car is during the approach.